Prices on this page include the Australian GST applicable for customers in Australia. If you are not an Australian customer (including delivery to Australia) please order in US$ or order in British £. To order your caricature, please follow the steps as they appear below. A new step will appear as you make make each selection. You can make various selections to determine the total price (especially in professional printed options). All orders are screened by Matt, the Caricature King Coordinator. If there are any issues he will contact you or you can contact Matt here. Prices are determined per person and discounts apply when there are two or more people in the caricature. 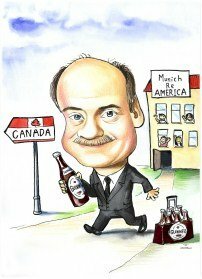 Discounts also apply to multiple caricatures on the same order. All our artists are trained and each has many years of experience. Unlike art done by hobbyists or sweatshops in Asia, you are commissioning custom art from a professional artist that will provide enjoyment for years or decades to come. If you have a question or have trouble ordering, please use live chat, or email matt@caricatureking.com or call Matt on 0409 349 752 with what you want and we will be pleased to assist you. Please start by choosing colour or black and white. Pay by Credit card, PayPal Note! If paying by credit card your statement will show "Plus One Marketing". Printed on quality gloss paper - and we have FREE SHIPPING, by Australia Post and a digital copy of the image by email.. Please allow an additional 7 days for print and delivery. Canvas prints are printed on medium weight artist canvas using super brilliant and fade resistant colors on a strong 1" stretcher frame. Images are non-wrap, that is the image does not extend beyond the flat surface (not on the sides). I accept extra postage charge of AUD 0 for delivery. 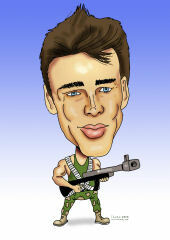 Your caricature will be printed on EPSON Premium Luster 250 GSM photo paper. 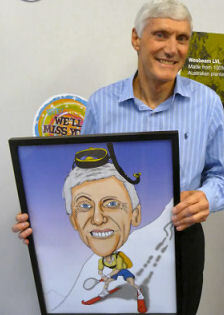 Your caricature will be framed in a moulded black wooden frame, quality clear acrylic UV-resistant glazing, foam core backing and dust cover backing, wall savers and hanging wire. Pay by Credit card, PayPal or MoneyBoookers Note! If paying by credit card your statement will show "Plus One Marketing". This product option includes all othe body. Different clothing can be specified. Props, if desired, are normally non-complex items - and may be something that a person is holding or leaning against. Typical prop items are backpacks, fishing gear, sporting items, musical instruments, hand tools, or even some lettering, etc. Backgrounds are either white, plain color or a simple graduated colour.